The extent to which religion is structured on post-truth principles forms the subject of this chapter, which looks at how this works within Christianity and Islam. Creationism, for example, refuses to accept the findings of modern science, holding fast to a dogmatic belief in the literal truth of the Bible. Religious philosophers, such as Anselm of Canterbury, construct proofs for the existence of God which can only end in a positive conclusion; theological doctrine demands this. Recent attempts, as in the work of John Caputo, to apply postmodern thought to theology are analysed, and the postmodern philosopher Jean-François Lyotard’s arguments for adopting a pagan attitude to belief are also looked at in this context. 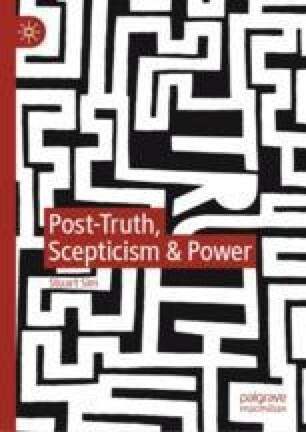 The chapter concludes that religious belief, as in all instances where post-truth is being deployed, is best met with scepticism and doubt. Quaker Faith and Practice: The Book of Christian Discipline of the Yearly Meeting of the Religious Society of Friends (Quakers) in Britain, 5th edn, qfp.quaker.org.uk/chapter/1 (accessed 10 April 2018).